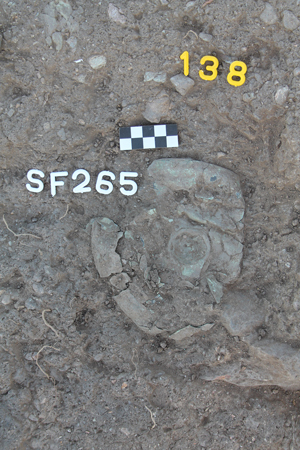 The 2013 excavations at Plakari provided some valuable insights into the structural developments of the cult site during the pre-Classical period. In Tr. 1c we dug the last part of the sacrificial refuse area, which again yielded large amounts of pottery (mainly EIA, but also later pieces), small finds and animal bones. On Terrace 2 we uncovered a long wall running north–south, with a rectangular stone feature (altar or offering table?) to its south (see plan: features in red), both datable before the mid-7th century BC. 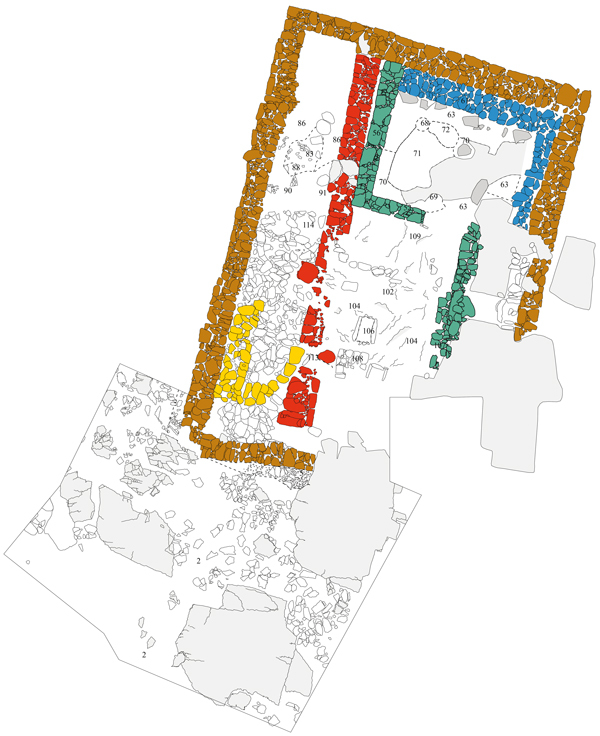 Perhaps in the later 7th or the 6th century BC, the entire area was enclosed by a peribolos wall (plan: walls in brown). Although made of local schist stone, considerable energy was spent on its construction and finishing, as became clear in Trench 2b, where we exposed its outer face and foundation layers. The space between the ‘red’ and ‘brown’ walls was at some point filled in with large stones, which had probably tumbled down from the ‘red’ wall. On this platform, a semi-circular stone feature was constructed (walls in yellow). Burnt material found inside and around it indicate that it served as an altar. In 2012, we uncovered a number of metal finds in this area; this year, we found more iron knives and a bronze phiale mesomphalos. To the north of the semi-circular feature we found a series of surfaces, again with clear traces of burning. 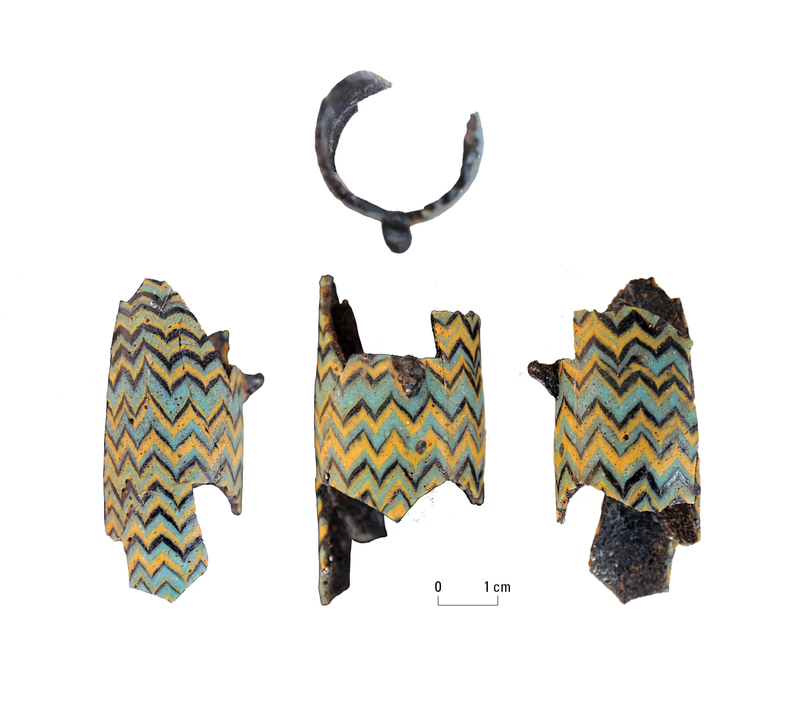 Broken pottery and animal bones indicate that this area was used for sacrifices and ritual eating and drinking from the late 6th to early 4th centuries BC. During the late 5th or early 4th century BC, the living rock east of the red wall was levelled. The hestiatorion was constructed in the NW corner of the peribolos. The open-air area to its south contained schist-made bins and a stone platform. In 2013, we uncovered wall un. 107 in the E part (plan: walls in green) that helped to create a low platform, on which a third, bin-like feature was located. Higher on the hilltop we excavated Tr. 9, located near the rock outcrop with the two rock-cut niches. Unfortunately, it appeared to be entirely devoid of archaeological remains. Evidence of a human presence at Plakari in a much later period is provided by a temporary structure found close to the summit in Trench 5. On the basis of the find of an Ottoman coin, it can be dated to the early 19th century AD. It was possibly an outpost or lookout of the Ottoman army, which was based much further inland at the medieval castle of Castel Rosso.